Previously, we speculated that the reason for two dates floating around the Galaxy Note 2 was that there were going to be two versions released, one for the US market and one for international customers. 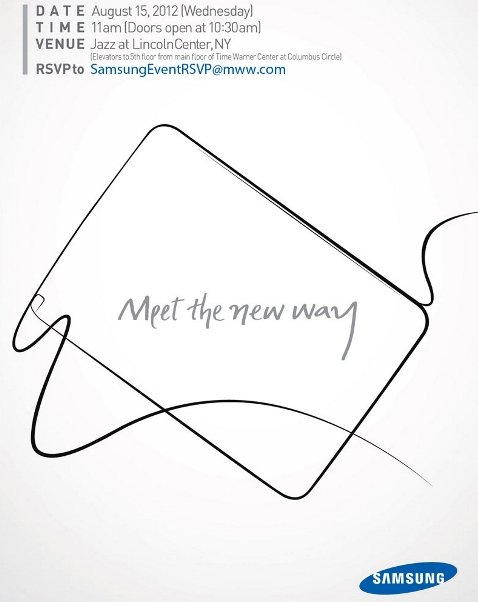 However, we’ve seen new evidence that confirms that the August 15 New York event will be for an entirely different Galaxy Note device. The Galaxy Note 10.1 was first announced last February at the Mobile World Congress to great acclaim, with a lot of people praising to how well Samsung’s S-Pen stylus lends itself to an even bigger screen. Current information points to the Galaxy Note 10.1 having 1.4 GHz quad core processor, an upgrade from the dual-core processor that it came with when it was first revealed. It has a screen resolution of 1280×800, 16 GB memory (expandable through SD card slot) and 2 GB of RAM. For Instagram fans out there, you’ll be glad to know that it will come with a 5 MP camera that is also capable of 720p recording. You can also take decent self-shots with the 2 MP front-facing camera. What will really differentiate the Galaxy Note 10.1 from other tablets in the market is the S-Pen stylus which can be used to draw and write on the device and should also work nicely with the Photoshop Touch app that it will come pre-loaded with. Excited for the Galaxy Note 10.1? Does it have all the features you’re looking for in a tablet? Share your thoughts in the comments below!